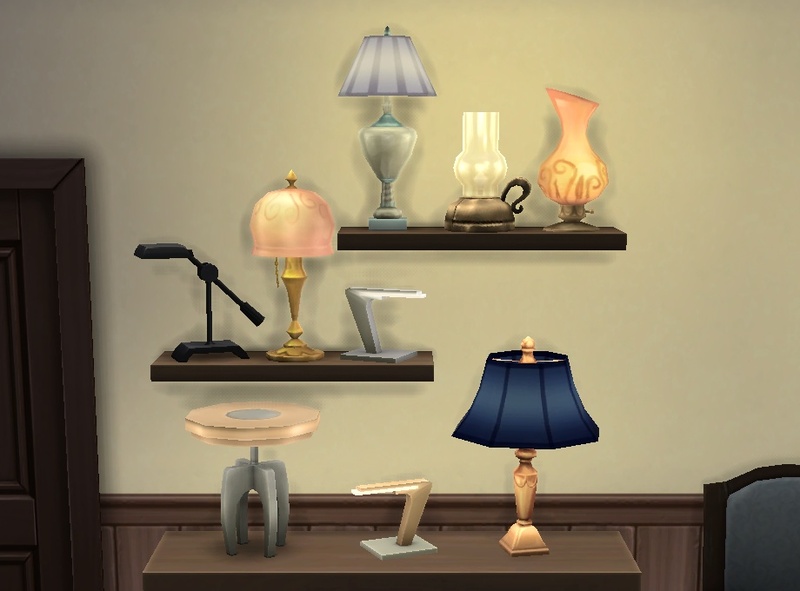 Assorted placement edits for some of the smaller table lamps plus a fix for the broken dropshadow on the "Return Desklight" (see screenshot #2 for how it looked like, in case you haven't noticed). Update 2014-12-16: Today's patch makes it so that half of this mod is not necessary any more – please use the bb.moveobjects cheat from now on to place those lamps that won't place otherwise; the dropshadow thing has been fixed in the game files too. Updated with the obsolete edits removed. s4pe 0.2c/d + wrappers by Inge/Snaitf. Awesome; thank you! That ridiculous shadow has been keeping me from using a perfectly good lamp, and although I hadn't wanted to put lamps on shelves before, I sure do now! Finally. If I want to put my table lamps on the floor, I'll put them on the floor, damn it! Really useful. I hate how all the shelves and whatnot have so few clutter slots and no slot for lamps. Now all we need is more slots on kitchen counters! You should have been able to put anything on the floor in the out-of-box game already. Also, this has nothing do to with slots, I'm editing the *lamps* here, not shelves or anything else. Ah, fair enough. Well either way, I can finally put lamps on shelves! I was only wondering today, after having downloaded your window fix yesterday, whether you would be the person to fix that broken lamp shadow and here you have! Any chance you could take a look at the broken Simple double door found in the prebuilt gyms? I'm not interested in that double door myself (I don't use the prebuilt lots and all of my own are kinda rural / traditional right now). But if you want to fix it -- you know how to use s4pe, right? --, if it's a similar issue it would be a wrong reference in one of the MLODs. In the window it was quite easy to see since it was only wrong in one colour .. so if you compare them all you should be able to spot the one that is off. Best post in Create if you have questions! That desktop lamp was soo annoying. This message has been deleted by plasticbox. Reason: No requests. I have been waiting for this. Thanks a bunch! Thank you for making the lamps more useful. Hope you are doing well.